I had my first week home with Ben and everything was awesome. We had a lot of fun together, but we are really happy that Daddy is home today to play with us! 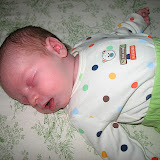 Over the week, I took a few pictures of Ben trying not to miss a moment (what else do you expect from a new Mom?). See below for some of the cute ones! ALL the pictures are the "cute ones"! Do you see a difference?